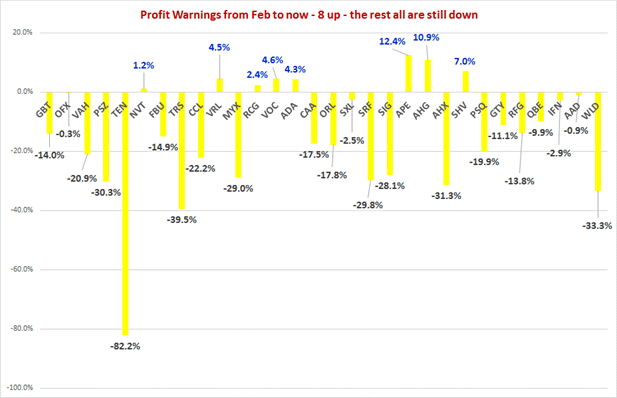 Of the profit warnings this year, 81% of them have been "downgrades". 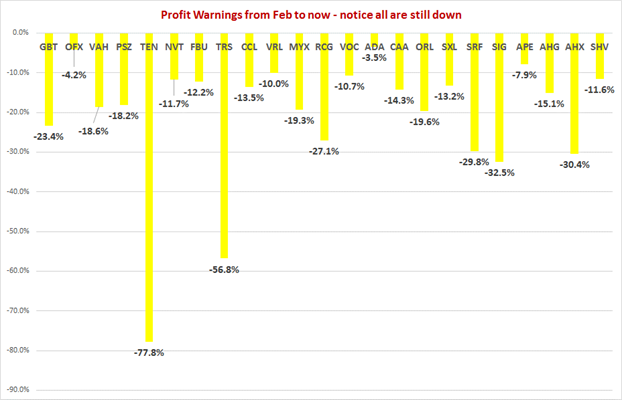 I have found some really interesting observations that I’ll mention through this note that are worth being aware of, before then discussing the main 15 "Positive" Profit Warnings in 2017. 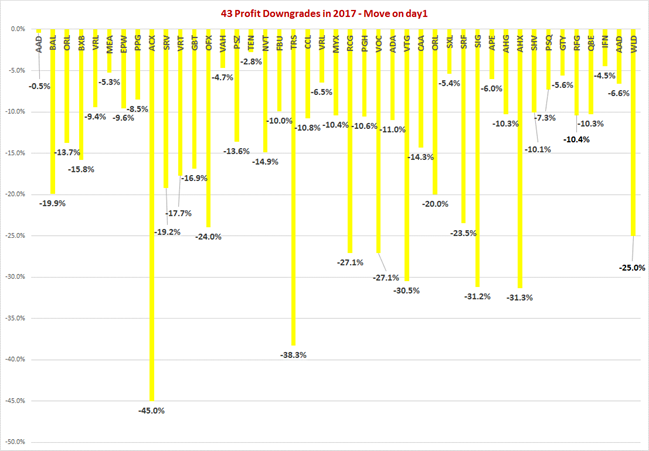 Of that 43 of them were profit downgrades& just 15 profit upgrades. Of them, 15 of these downgrades came earlier in the year - before they reported in Feb– so some stocks have since reported. But some - like Brambles for instance - even though they had a profit downgrade ahead of their result – they still disappointed the market when they reported. 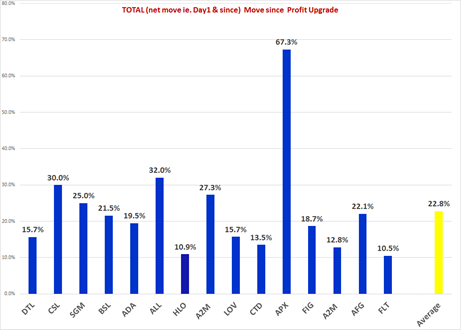 We have seen 20 stocks rise since then(ie they have seen their bottoms & bounced back on average by +12%. 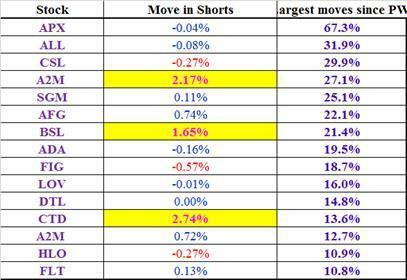 Also what stood out about them was that the short interest was huge in all at 4.30%. So with some I’d say that there was definitely short covering by those who had been short before, or as we have been approaching reporting season a lot of these stocks have rallied in JUST the last 4 weeks. Thus when looking at say ACX saw short covering, where their shorts have come back from 15.96% to now 12%& stock has recovered +12% from the day ‘after the profit warning. Also “special situations” like Vocus (potential takeover) & Bellamy’s (an acquisition) have recovered due to ‘positive news’..
For these stocks (only 7 then) that were down -22% day 1 they are still down -11.3% since the warning. 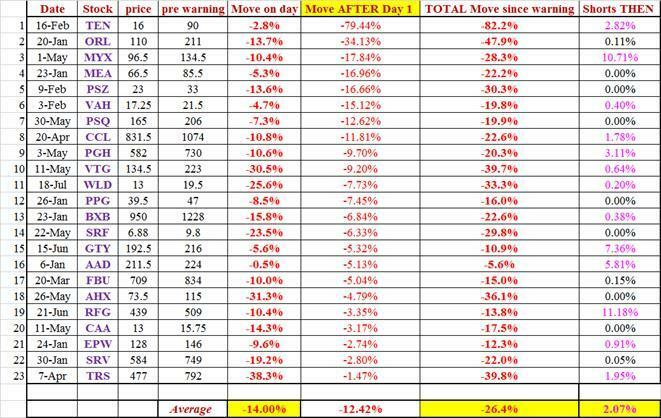 But now - For these stocks (there are now 20 as more have “recovered” as we get closer to reporting Season) that were down -16.2% day 1 they are only now down -4.1% since the warning. 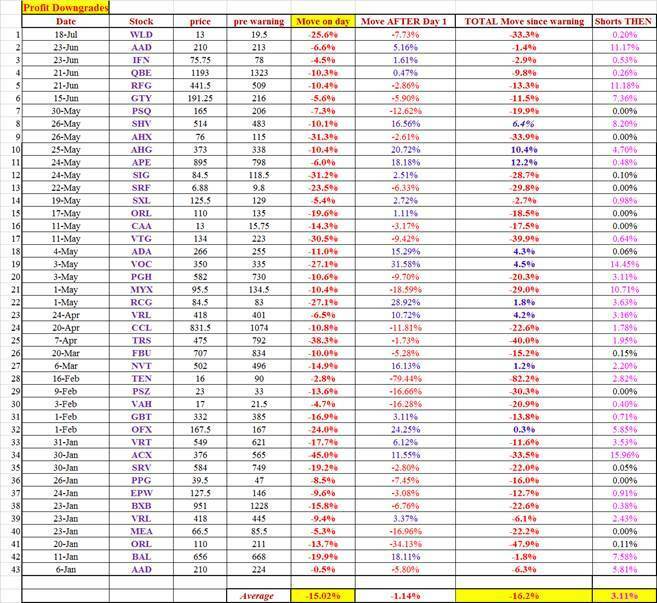 The 23 that have “continued to fall” are now down by “an additional” -12.4%. What stands out with these is that on the day of the warning these stocks were not sold off hard enough, falling only -14% on the day. But following that it looks like either instos sold out or shorts came in & hit these stocks further – to be down another -12.45% after Day 1. 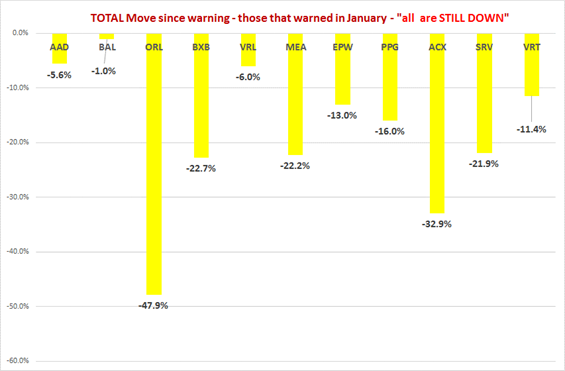 So total fall, in them, has is now a massive -26.4% since the warning day. Firstly the stocks in January – notice ALL are still down !!!!! 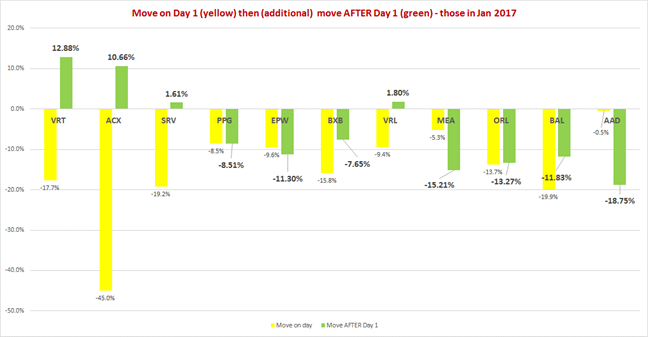 Secondly the stocks from Feb to July – 8 have recovered…. 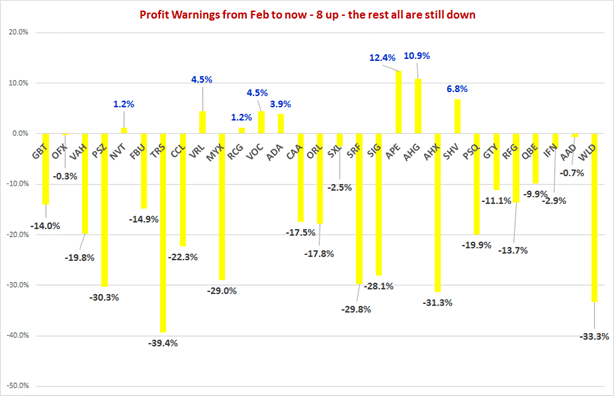 So it its important to understand that (to me anyway) it seems instos are happy to "avoid" or sell the profit warning stocks & stay away - but with Reporting season approaching a few instos are buying them in anticipation that we may have seen the worst & the stock turns.. 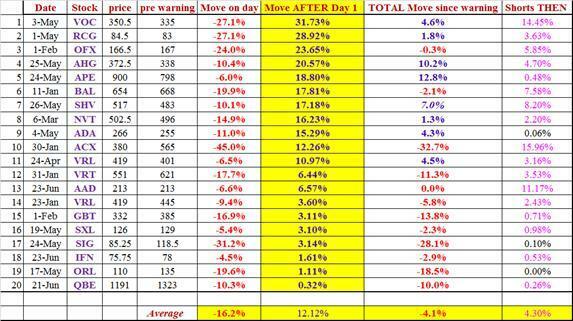 This was from (30th May) moves in stocks that warned from Feb to May – also these are all still down !! But in recent weeks many had "suddenly" been recovering !!! 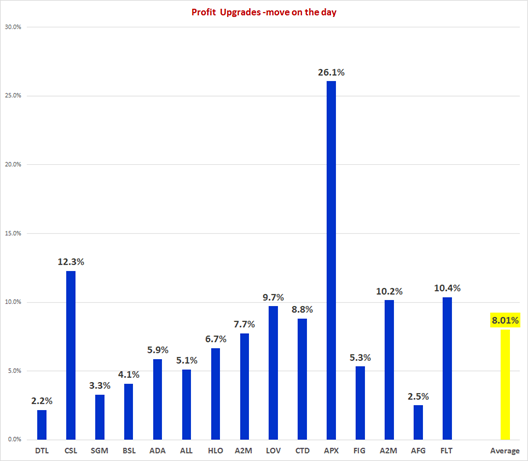 & since then as a group they have added an extra +14.95% to now be up +23%. 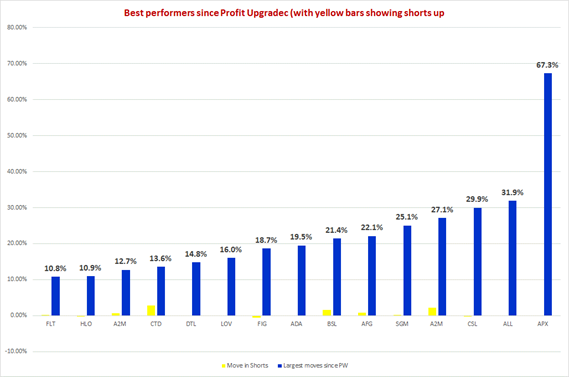 With the profit upgrades 3 stocks that had shorts on already – saw the shorts “increase” rather than cover as they think that they will still be right & stock will fall. Table shows best performing stock since profit upgrade & how its short interest of total coy moved.. 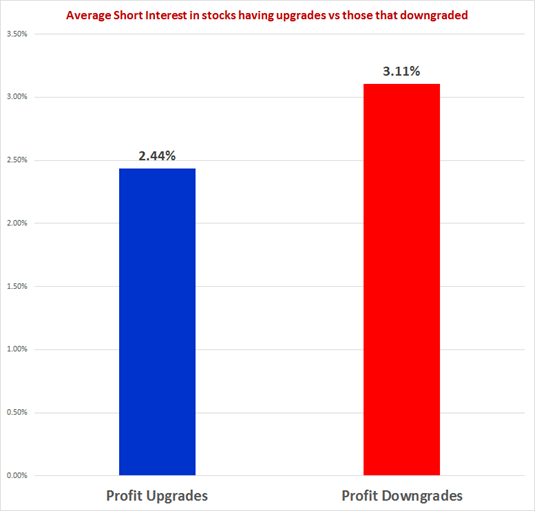 While the 43 stocks that had “downgrades” had average short interest of 3.11%. 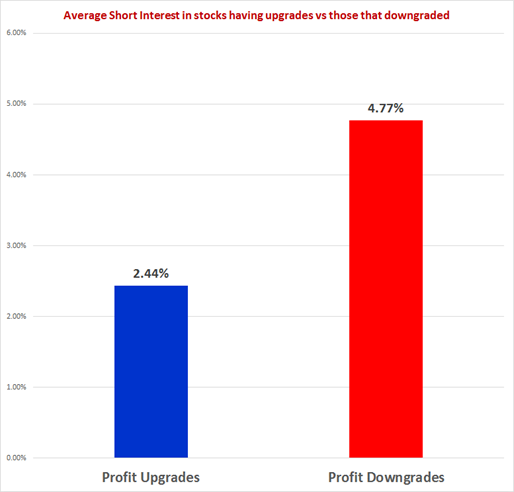 BUT if we compare to the stocks – in the profit downgrade camp- that can be shorted -then 15 stocks that have near zero short interest are eliminated. So on that basis the 28 stocks that had “downgrades”had an average short interest of 4.77%. 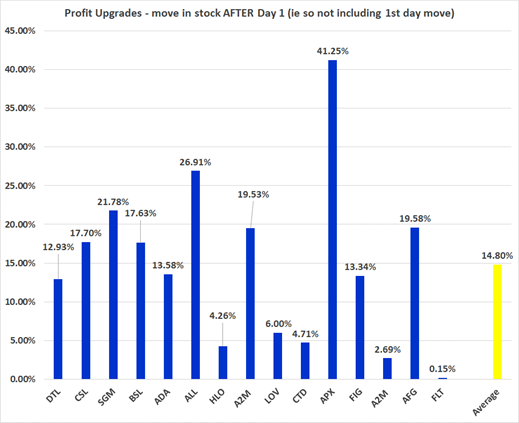 very enlightening deep dive - minor correction as A2M released 2 profit upgrades in the period, it is in there twice.. making it 14 profit upgrade stocks for the 15 profit upgrade notices. 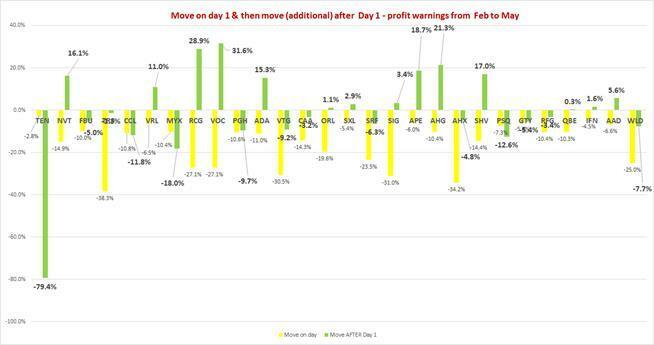 Sadly A2M's first upgrade for the period followed a profit warning in Feb - or rather a flat projection - A2M tends to forecast over-conservatively.. which on the day and subsequent weeks caused selling & shorting that would not have happened if they had said nothing until their April upgrade announcement. I don't see A2M in the downgrades side - so maybe you don't consider it a profit downgrade - or it's excluded because the flat outlook was predicted in Feb after the good 1H result.